Amazon has some great deals going today for President’s Day weekend, like these luxurious pillow toppers that fit any mattress and feel like you’re sleeping on a cloud. In our humble opinion, though, the star of the show has to be the DROCON Drone X708W FPV Training Quadcopter With HD Camera. 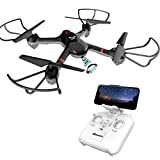 For just $41.99, you get an awesome drone that streams live HD video to your smartphone while you pilot it. It also has headless mode, which people love, and it can do flips with the push of a button. But the best part has to be the special feature that lets you press one button and have the drone fly itself back to your location, wherever that might be. You’ve got to check it out! This is an Amazon deal of the day, so the price is only good on Saturday. Grab one while you can!